American heritage brands' lack of extravagant ad campaigns or the perception of a complicated marketing strategy is a major part of their appeal. The idealized heritage brand marches on unaware and unconcerned with fashion trends, instead focusing on core customers and quality products. 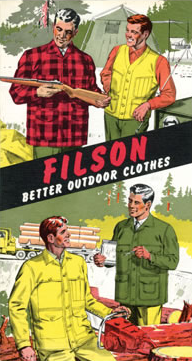 Filson is now trying to expand their business while staying loyal to their brand image. The Portland store exemplifies these efforts. I met Nathan Gray, Filson Store Manager, a couple days ago on my visit to the store and chatted a little about the possibility of Goldwin Inc, Filson's Japanese Distributor, opening a store in Tokyo. Yesterday I exchanged a few emails with Nathan and continued our conversation about the heritage movement and Filson's retail strategy. Here are a few questions with Nathan. Foster: How much business do you get from people buying Filson due to the recent interest in American heritage brands? Nathan: So far, the vast majority of our sales have been from our loyal Oregon customers who are delighted that we've opened a store closer than Seattle. I hope that our great location in the Pearl will turn a lot of new customers on to our brand. I believe that Portland will be an ideal location for us due to the interest in American heritage brands and the strong attraction this community has for natural products. Foster: So Filson is using the Portland store as concept store to test the waters of expanding Filson to a new market? Interesting. Nathan: I don't know that I would describe us as a "concept test store." One of the goals of any retailer is to increase their customer base, and hopefully the amount of exposure we will get here in the Pearl District will help in that aim. Filson's apparent marketing strategy differs from that of other American heritage brands like Woolrich and Red Wing, who have launched sub-brands to capture on the resurgence movement. These sub-brands, Woolrich Woolen Mills and Red Wing Heritage, have their own websites, sales distribution, and collections. 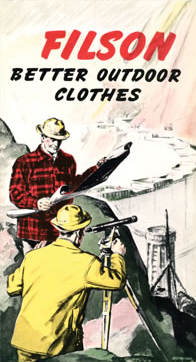 Filson has instead tried to overhaul their own brand by putting up vintage ads on their website (as attached in the article), and launching stores in strategic locations, Portland and potentially Tokyo, to capitalize on the resurgence movement. My conversation with Nathan accentuated the differences between Filson and Woolrich and Red Wing's approach to capitalizing on the resurgence movement. It will be interesting to see how these two different approaches will weather the economic crisis and the current heritage fashion trend.